It must have taken more than a little bit of magic to get SpongeBob out of the ocean, but he gave us all a shot of adrenaline to the heart when he brought the gang out of the sea and into the wife open world of oxygen in Sponge Out of Water. We're still reeling, honestly. If you're ready to get that giggly yellow sponge dude out of Bikini Bottom and into your hometown, might we suggest that you suit up with this Adult Inflatable Spongebob Movie Costume? It will give you the look that he had when they all saved the day from Burger Beard and you can talk over party favors about the Hash-Slinging Slasher, Doodlebob, and that ever-elusive boating license. You could tell jellyfishing stories, brag about your top-secret Krabby Party clearance, or even complain with other creatures helplessly obsessed with obtaining a license that's a bit out of reach. Slip into this awesome suit and you'll finally be able to make all the Krabby Patties that you want, and you won't even need an intergalactic dolphin to pull it off! It's 100% polyester, requires a few AA batteries (good thing you're out of water), and features a back zipper from waist to the top of the hood for easy access in and out. 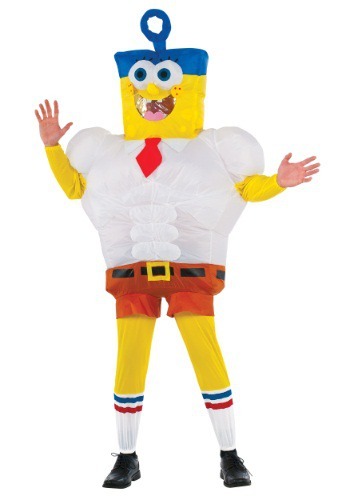 Extra points if you can juggle two Spongebob-themed costumes in a single setting. We recommend Spongebob and Squidward—you know, for the empathy it'll inspire in your heart for annoying fry cooks and cynical neighbors.